What Causes Your Dentin to Darken? Everyone wants to have a perfectly white smile. Walk into the pharmacy department of any grocery store, and you will see shelves upon shelves of dental products. From toothpastes, to mouthwashes, to home whitening kits, the options to whiten your teeth are endless. So why does it seem that, even with all these options available, your teeth often darken as time passes? The answer is simple and, fortunately, so is the solution. To understand why your teeth darken, you need to first understand how they are composed. Most people know that the tooth has multiple layers. The hardest layer on the outside is called the enamel. This is what most people see when they look in the mirror. However, as time passes, the enamel can wear down, exposing a softer layer underneath. This layer is the dentin. Dentin, in addition to being softer, tends to pick up discoloration more easily than enamel. 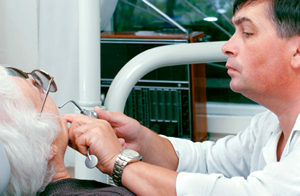 This is why it frequently seems that older people have greater tooth discoloration. There is actually not any one factor in the darkening of your dentin. As noted above, it does tend to pick up stains faster than enamel. In addition to this, certain types of medications can cause the dentin to become discolored. And of course, certain drinks such as coffee, tea, and wine will accelerate the problem. Other habits such as smoking or chewing tobacco can lead to tooth staining, as well. Regardless of the source of the issue, if you want to explore tooth whitening, we can help you. With today’s dental technology, there are actually several options for you if you want a whiter smile. Talk with us about it and ask which options would be best for you. You will find the solution to be easier and faster than you probably expected.